"Shaq” played basketball and track in high school. She earned All-League honorable mention her senior year for basketball. Last season she was the a defensive specialist for the bulldogs. Her athleitcsm helped create steals. 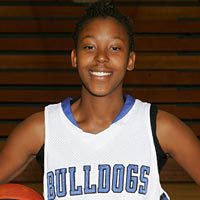 She is quick and can penetrate the defense to get to the basket. She has also developed a consistent outside shot. She enjoys writing poetry, singing, and laughing with her friends. She hopes to be the best defensive player and earn a championship this season.